I was born in Quebec City in 1955. My parents met at the School of Fine Arts. My father was a sculptor, an art teacher, and an editorial cartoonist for a newspaper. My brother Paul is a painter living in New York City. I love visual arts but majored in French literature. When I was a teenager in the ‘70s, photography magazines were popular and I discovered Ernst Haas, Jeanloup Sieff and the like. With a borrowed 35mm reflex camera, I would shoot haphazardly in black and white. Waiting for the contact sheets from the photo lab was more exciting than the actual photos. I bought an Olympus OM-1 with a 50mm lens on a visit to Chicago in 1978. By coincidence, it was the 10th anniversary of the riotous Democratic Convention, and I took black and white photos of the small commemorative demonstration. I later acquired a Zuiko 28mm lens and a Vivitar 70–210mm zoom. Although I had no formal photographic training, my studies provided avenues for inspiration. The three years I was in Paris on a grant, purportedly to finish my PhD in semiology, I actually spent more travelling in Europe with my camera bag than studying. Back in Montreal in the early '80s, I gave up my thesis and went to work first as a copy editor for McGraw-Hill and then as production manager for the Canadian Centre for Architecture. While at the CCA I had the opportunity to meet Lee Friedlander, Geoffrey James and Robert Burley, who were commissioned to photograph the Frederick Law Olmsted parks. 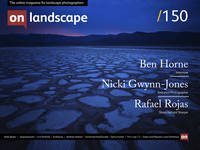 The resulting publication increased my interest in landscape photography. I went on to be CSR for a print shop working for art galleries and museums. I studied Web Design and built my photography website in 2014 (phototrope.ca). I now work as a senior editor for an online college and design printed books from time to time. My photographic epiphany occurred in 2002. Impressed by the convenience of digital cameras, I had purchased a Nikon Coolpix 995 with a whopping 3.1 megapixels and $2,000 price tag. While on vacation, strolling on a beach in Kouchibouguac Park, New Brunswick, I took a vertical photo of a pebble at the end of a wavy sand deposit. Looking at it later, I realised that the composition wasn't bad. It was this photo that truly gave me the impetus to explore landscapes. My photos were often out of focus until I learned about hyperfocal distance. In 2008 I bought a Canon 40D and a Canon EF-S 17–55mm f/2.8 IS USM, but soon realised the camera's dynamic range wasn’t ideal. By this time landscape photography had become a passion, a necessity. In need of better gear, I read reviews and chose a full frame Nikon D750. Enter Bruce Percy. I find his work astonishing and his blog very inspiring. Percy is able to rationalise his aesthetic approach, not just discuss equipment. When I had to decide on a lens for my Nikon, he convinced me to start with one prime lens. As he says, let your feet be your zoom. I found this idea of physically moving into the landscape appealing, although many photographers are very adept with their zooms. His advice to buy one lens and master it before buying the next one was useful as well. It enables you to see the way your lens does, instead of juggling with all sorts of lenses and guessing at what you’re trying to achieve. My primary lens is a Sigma 35mm f/1.4 DG HSM Art. I decided against an extra wide angle, fearing that the distorting effect would be too repetitive. My second lens is an AF-S Nikkor 85mm f/1.8G. This focal length is generally intended for portraits, but when a river or a ravine separates me from a subject, I find this lens does not exaggeratedly compress the scenery. I realise that most of my photos show water in one form or another. Water captivates me. It moves, it reflects, it’s a time marker that contradicts the static aspect of a photograph. I always use a tripod and a remote cord. My camera is set mirror up, in manual or aperture mode, and I compose with Live View. An app helps me to calculate the hyperfocal distance, and for this purpose, I carry a measuring tape and a rangefinder. I also very often use Lee neutral density filters and a polarizing filter. All this means taking pictures takes time, but that’s part of my introspection when hiking. Patience is also paramount. Waiting for the proper light or cloud formation when there is so much to discover during a hike makes me feverish. Same thing with the tripod. I’m often tempted to use it right away instead of looking around through the slung camera. I realise that most of my photos show water in one form or another. Water captivates me. It moves, it reflects, it’s a time marker that contradicts the static aspect of a photograph. Water flowing draws its own patterns, recorded by the camera, and adds a random element to the photographic act. Nature’s fullness is distracting. So for me, photography is a discipline of the eye. I try to structure my perception of reality rather than finding an immanent order in the visible. I’m quite sure that many of my compositions are influenced by the art I’ve seen in my life. I would like to go to Iceland, the Faroe Islands or Argentina’s Altiplano. But how many more images of Iceland’s Skógafoss do we need? Still, iconic places deserve their reputation. They epitomize the sublime and stir our emotions. There, most tourists will take clichés and selfies; the good photographer will take original images. Many of my photos are taken within 50 km from home. I like the physical effort involved in landscape photography as if I have to deserve the beauty of nature. Finding locations with no human intrusion is difficult. George Hampton, a field recording artist, says that today there are fewer than a dozen quiet places left in the United States. This number is probably lower in most countries. Everywhere you go, you will hear at least an aeroplane. The Quebec national parks I've visited so far are nice, but the rumour of civilization always creeps in. I like the fact that photographs are silent. As much as Percy inspires me, I don’t try to imitate his style. The square format he prefers effectively suppresses the superfluous, but I find the standard 3:2 ratio I use can also generate strong images. Like Percy, though, when assembling elements I want to create a dynamic path for the observer's eye. Sometimes composition is easy, a sort of foreground-background obviousness. Otherwise, I usually obey a principle of exclusion. I link elements that are part of an indivisible whole. I sometimes find the Live View screen deceptive. At this scale, the composition seems to work nicely, but when looking at the bigger image on my Mac, the spatial relations fall apart. Very often I go hiking without taking a single picture. I don’t like to shoot indiscriminately in the hope of finding a good image back home. On the other hand, digital photography allows strafing, and some photos can reveal themselves in post-production. But the ability to visualise pictures before taking them definitely helps the creative process. Ansel Adams described a mountain hike in 1927 when he could only carry 12 glass plates. He spoiled five unwillingly but was able to turn out a masterpiece with his very last plate. I always shoot in RAW and make small adjustments in Adobe Camera Raw. Then I fine-tune the tonal curve in Photoshop. I'm not keen on HDR, supersaturated images, or extreme effects in my own work. I use Silver Efex Pro for some of my photos, but with restraint. No camera can render reality faithfully, and every photo is an interpretation. As an object of contemplation, a photo can take some degree of retouching if its author deems it necessary. If the glare of a lens can be removed, I will get rid of it. For my first exhibition in 2017, I wanted my pictures well printed and framed, using acid-free materials. A 10-colour inkjet printer and pigmented inks were used on Moab Entrada 100% rag. The result is quite stunning and demonstrates again the difference between the screen and a real print. To my relief, it also proved that my camera and lens were doing a good job. My photos are held on a foam core with one piece of tape over the top margin. A mat, glass, and black aluminium moulding complete the framing. From December 5th to 31st, 2017 at, Librairie Bonheur d’occasion, 1317 Mont-Royal East, Montréal.